Residents of the Greater Heights and Garden Oaks communities take great pride in the rich history and charming scenery surrounding their neighborhoods. As a locally owned and operated business, so do we. Texas Waste Co. is proud to be a part of this community, offering the best sanitation solutions available for construction sites, festivals, concerts, private parties, and more. Because our sense of community pride is authentic and home grown, we share a deeply seated commitment to providing top-quality waste sanitation solutions. We deliver and regularly clean porta potties, as well as restroom trailers to meet city codes and ensure that workers have a safe and clean environment to do their jobs. Our standard and ADA-compliant porta potties coupled with our hand washing stations provide the perfect sanitation solution for any event in the Greater Heights and Garden Oaks community. For classier affairs, we offer luxury porta potty and restroom trailer rentals so guests can enjoy all the lavish comforts of indoor facilities, outdoors. Residents and businesses depend on our friendly service because we place great importance on quality control and customer satisfaction. As a progressive sanitation specialist for the Greater Heights and Garden Oaks communities, Texas Waste Co. implements the latest on-board service technology to guarantee great service that will exceed your expectations. 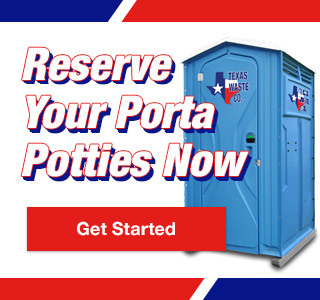 We clean and maintain all our own facilities to ensure they meet the highest standards and we can deliver any porta potty rental same-day at a reasonable and easy to understand pricing structure. Greater Heights was developed from a section of land originally purchased by Oscar Martin Carter and a group of investors in 1891. First founded as a streetcar suburb of Houston, the community experienced substantial decline in population during the mid-to-late 1900’s before shifting into what is now recognized as one of the most desirable places for young, highly paid professionals to call home. Edward L. Crain established Garden Oaks in 1937. The western neighborhoods of this city were originally constructed for veterans returning home after World War II. Today, Garden Oaks is recognized as a nature-loving, tree-rich community with an abundance of restaurants, above average biking trails and several well-appointed recreational parks. Find out what makes Texas Waste Co. the trusted sanitation solution for Greater Heights and Garden Oaks. Call us today!